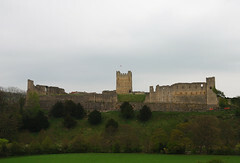 We are on our way to Edinburgh today, our first stop was Richmond Castle. It was built in 1071 by the Normans. We only stopped briefly to take a few photos, much of this trip around the UK has been unplanned and we are really finding things to see by chance. Its worked well so far, we’ll see what else we run into down the road. Thanks for the tip but we are already back in london, just a little behind in our story telling… we’ll catch up eventually Tonight we leave for Paris.